Do It Yourself Mechanics is an absolutely complete Do-It-Yourself vehicle repair center located in Sterling, VA (near Claude Moore Park and Dulles Town Crossing). The safe, fully-licensed ultra-modern facility offers a professional, clean work environment with professional bays, lifts, tools, automotive supplies and shop equipment for rent for the hour, day, week or month. Each rental bay comes with a 210 piece tool set. 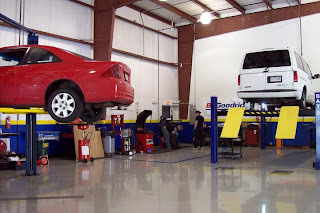 This very unique, one-of-a-kind concept of auto repair helps save up to 50% or more on auto repair expenses – in addition to offering the regular or weekend auto mechanics enthusiasts a fantastic venue to learn and practice the craft. The do-it-yourself option is supplemented as needed by onsite, certified mechanics and staff to assist with more complex or challenging projects. All kinds of training classes are in the works, as are special deals including long-term rentals for independent mechanics, late-night fleet vehicle services, and wholesale pricing on tires and remanufactured engines or transmissions. Special Event – On Wednesday- September 29, Do It Yourself Mechanics will host the Pit Crew from 1067 THE FAN as they record their show from the shop! Sign up for an invitation entitling you to a hors d’oeuvre-style buffet dinner provided by Mimi’s Cafe (served at the shop from 5:00 to 6:00 PM). Also included is a special photo session with the Pit Crew as they record and stream their radio show for CBS SPORTS- 1067 THE FAN. Advance Auto Parts, BG Products, Cornwell Tools and Auto Magic Cleaning Supplies will be there for consultation and/or advice on all car and tool needs. Staff from the nearby Allsports Grand Prix (Indoor Karting!) will also be in attendance – “helmet not required”. There will also be special drawings and exclusive prizes for guests – RSVP soon (via the Do It Yourself Mechanics Facebook Page or through the website) as space is limited and is sure to fill up fast. Find Do It Yourself Mechanics online, and at 21606 Cedar Lane Ste 100 in Sterling VA – or call them at 703-421-8855 to schedule rental times from 9AM-8PM M-W, 9AM-9PM Th-Sat, and 9AM-6PM on Sundays. A “Made in Loudoun” Video Production for Vintage 50 Restaurant Group in Leesburg, VA – optimized for internet marketing, online web video marketing and other Loudoun, Northern Virginia, Maryland and Washington DC web video business marketing purposes. Vintage 50 is a huge proponent of organic meats, locally-grown vegetables (in their backyard! ), onsite beermaking (the only private brewery in Loudoun! ), and many other very classicly Loudoun County VA features.